This character's profile is currently out-of-date. I'll still use Catherine for forum games, and you are still allowed to interact/draw her, but her profile is currently in need of a revamp. Please check back later! "I'll help you, I promise!" Catherine is a mysterious girl, whose face is hidden. Despite wearing a Jester's Hat, she isn't a fool, but in fact an immortal being who acts as someone's guide. It is unknown when she was born. Catherine resembles a child, and has long, messy dark blue hair, which is longer than herself. She wears a dull blue garb, with sleeves longer than her arms. As I said, her face is hidden, with only a pair of red beady eyes visible. Her scarf is light cyan, and she wears small, brown shoes. 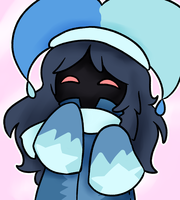 She has a soothing, but cheery personality, and is clumsy, since she often trips while on land, which is why she is always seen levitating. It's revealed that she is related to the devil lollipop. Years ago, Catherine was born as a beautiful, young woman, with a personality being different compared to her current self. As the good witch of the cosmos, she gave blessings to the inhabitants of Urd. 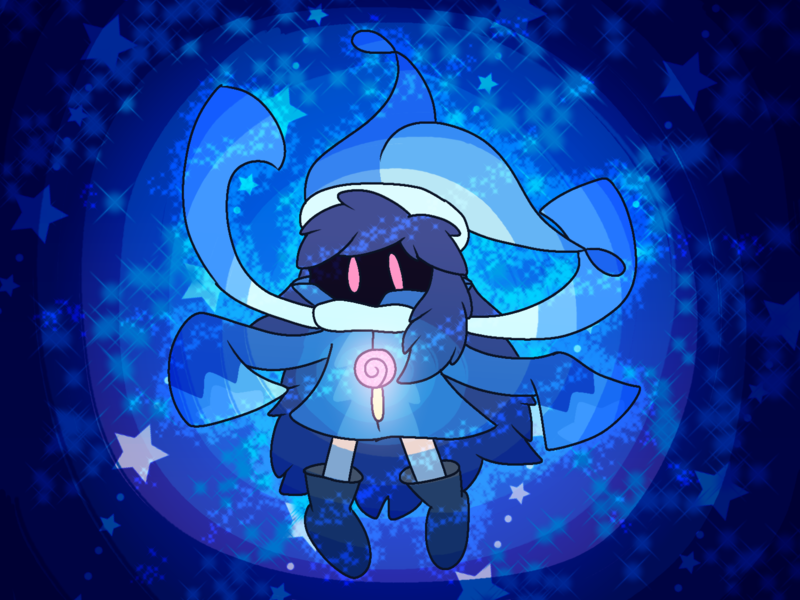 However, one day, she engaged in a fight by her mortal enemy, Thanatos, and despite her victory over the latter, she was transformed into a child, and her astral magic was sealed, due to an odd force. She remained that way for hundreds of years. At some point in time, when she arrived to BonBon Island, Catherine discovered a "lollipop", whose head is on a Popsicle stick. She has since treasured it. 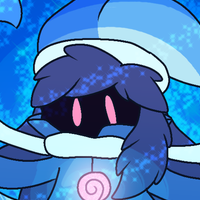 Based on how her face is hidden, she is somewhat similar to the black mage from the Final Fantasy series, and to a greater extent, Kirby characters such as Magalor and Drawcia, sans the red glowing eyes that are visible. Though yet to be shown, Catherine is said to use Astral magic, a kind of magic which uses the power of the galaxy. She rarely has a sense of humour. Speaking of candy, her favorite kind has to be lollipops. When Catherine finds Ben washed up on shore, she tries to wake him up, but once she did, she ran away from him, acting if she is shy. However, since Ben finds Catherine to be a "nice girl", they became friends. Catherine and Gumball used to be friends, but ever since Gumball became very greedy about candy, he wanted to steal Catherine's devil lollipop, thus becoming a traitor to her. Both Catherine and Sonya seem to be good friends. Noting else is known about their relationship so far.